Head to Gojo, off of Thompson Lane, for a flavorful interactive meal and a ceremonial coffee presentation. The injara, spongy sourdough flatbread, serves as the edible plate. What to choose on the bread is where the fun begins. There are several different wats, or thick stews. The way to go is a combo of veg and non veg platter (pictured above). This is a great option for two to three people. The shiro w’et (chickpeas) is amazing, seasoned with onion and garlic in a tomato base. It is similar to Indian chole. For non veg, the qeyW’et, beef stew, is highly recommended. 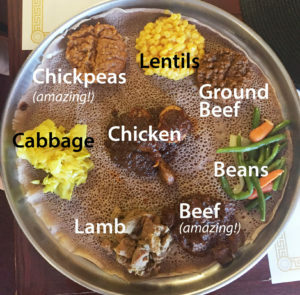 The stew is spiced with bergere, a common Ethiopian household ingredient consisting of chili peppers, garlic, ginger, basil, ajwain and fenugreek.In the center is the national dish of Ethiopia is doro wot, a chicken drumstick. Make note: kitfo is raw beef.